Happy Wednesday! I can't believe it's the middle of the week already. I also can't believe Thanksgiving is next week. We were able to get home for a quick trip over the weekend, so my sense of time is all messed up! I will share more from our trip next week. Today, I want to share a few more finishes. As I mentioned last week, my friend Aneela released some new patterns recently and I had the opportunity to try a few out! I actually made these projects a few weeks before the storage boxes, but had a hard time with the photos. I deleted about two weeks worth of photos last month that I unknowingly forgot to transfer to my computer. So I've been doing a lot of re-photographing! These are the Fold Over Mini Pouch and Needle Book Pattern and the Fold Over Sewing Pouch Pattern. The mini pouch and needle book are so quick to stitch up! And look how tiny?! 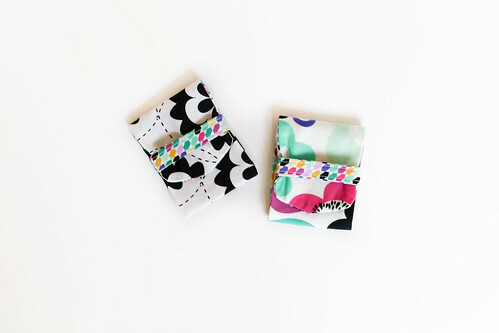 I love things in miniature, and these pouches are so cute! These will be perfect to hold little notions and needles of course! 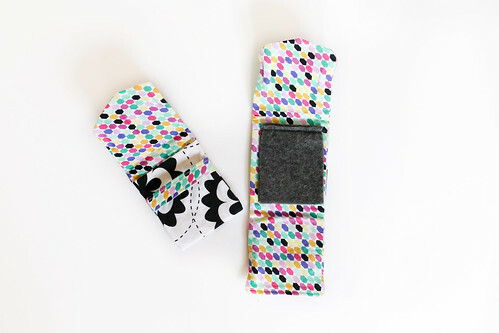 I wanted these pouches to be matching, so I used the Tessellate Huckleberries print for the inside of both pouches. The outsides are Fractal Garland Black and Radical Blooms Fresh, all from the Turquoise Angle colorway of Geometric Bliss. Making the fold over sewing pouch was a lot of fun. I have never made a sewing kit before, but I've always been drawn to them. I don't do a lot of hand sewing, but having a cute little pouch for it might twist my arm. I do love being organized about things! I love the way the Parallel Segments Seaglass print looks on the outside. Plus I got fancy and intentionally switched the direction of the closure to give it some extra interest. There are so many different features on the inside. 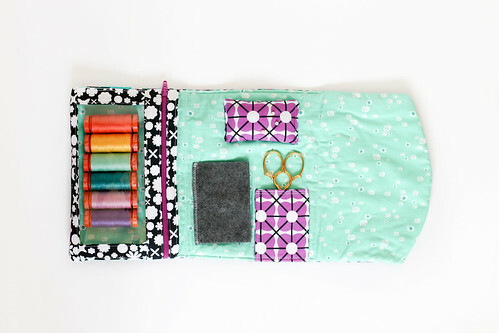 A clear zippered pocket, a small slip pocket, a pincushion, and a little needle book. A place for everything you need to get stitching. This kit would make a great gift, especially filled up with tools or notions! 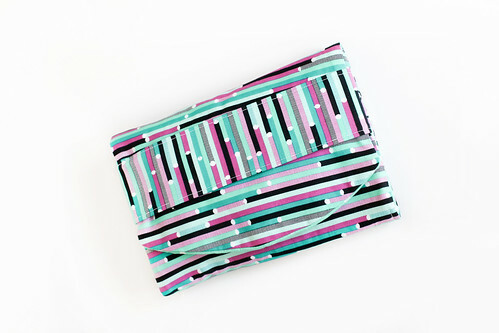 I again stuck with the Turquoise Angle colorway of Geometric Bliss for this pouch. I used Spherical Buds Aqua for the interior, Cuboid Orchid for the pincushion and slip pocket, and Polygons Callalily for the zippered pocket (my favorite bit!). 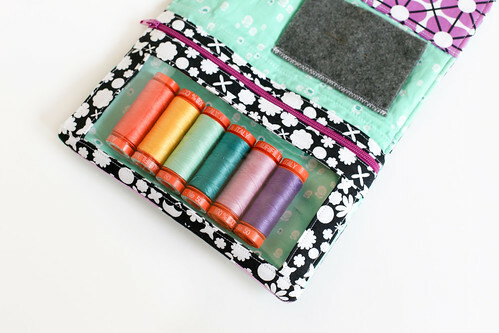 I used Aurifil 50wt thread in #2024 to sew this kit up, and of course had to fill the pocket up with mini spools from my thread collection! 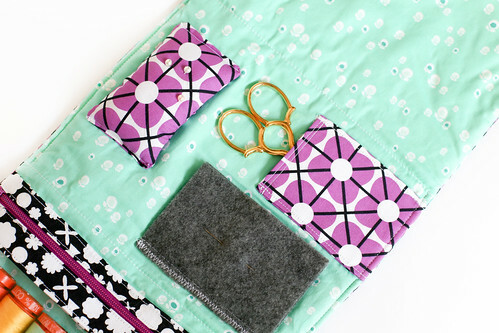 The zippered pocket was my favorite part of the project, I think it's so fun. It wasn't hard working with the plastic, and the construction was really interesting! I had a hard time choosing a zipper color, but the bright fuchsia looked too cool with the black and white, so it won out! The zipper came from Zipit! Hi Jeni - I have never purchased plastic before to use in a project. I am dying to make some pouches like the ones above. Any recommendations on what to purchase? I'm assuming plastic has some sort of weight/ durability rating? Also, I have caught your HST and log cabin coaster tutorials on It's Sew Easy. I have saved both in my DVR - you give the most clear, easy to follow instructions! Can't wait to try your projects (and start my quilting journey) soon! Correct! Aneela recommends 16 gauge vinyl for this pouch! These are super cute. 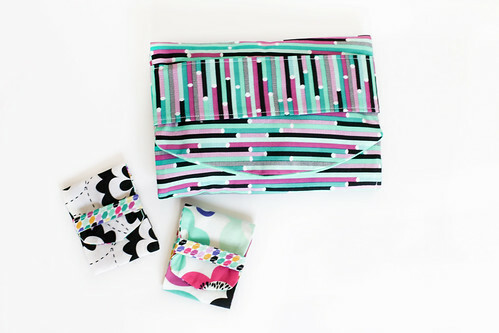 And I LOVE this fabric line!! You did such a good job with the project and the photos! I just got the pattern and am inspired to make the project too. Your fabrics really compliment the pattern.